Worked with local hotel and venue partners, business development managers and local industry associations to build relationships with local leaders and advocates of Wake County. By finding synergies between conferences that would benefit from meeting in the destination and the interests and expertise of industry leaders (both from the private sector and the universities and colleges in the area), we were able to make a stronger case to qualified prospects for hosting their organizations' meetings in their own backyard. Represented Raleigh, N.C., at more than 30 tradeshows across the U.S., with exposure to more than 25,000 meeting planners in the Midwest, Mid-Atlantic, Northeast and Southeast regions. Each show provided the opportunity for face-to-face and post-show digital client engagement. Hosted a "Taste of Raleigh Familiarization Tour," bringing in clients from out of market to showcase the destination to leaders and meeting professionals who have the potential to influence organizations to host their meetings in Raleigh, N.C. The event included local culinary experiences, education and comprehensive hotel tours. 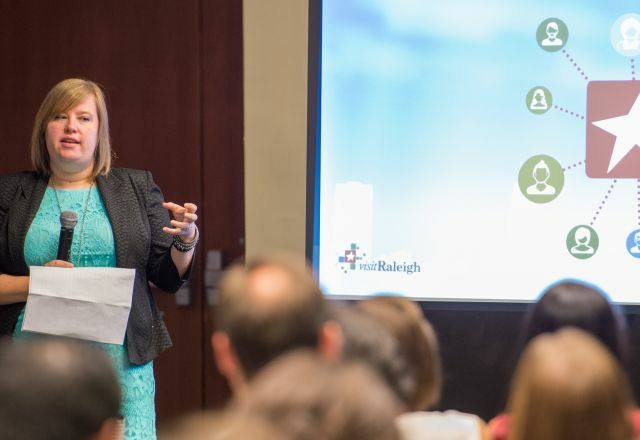 Hosted client events locally and out of market to showcase the destination to leaders and meeting professionals who have the potential to influence organizations to host their meetings in Raleigh, N.C. In partnership with the Greater Raleigh Convention and Visitors Bureau's (CVB's) Information Technology Department, the Sales Department launched an integration between the CVB's customer relationship management (CRM) platform and Cvent to create a more efficient flow of information for planners and partners. Cultivated and created new relationships with association management offices located in the Mid-Atlantic, Midwest, Northeast and Southeast U.S., where the Sales team conducted presentations to enhance our relationships with key decision-makers of multi-volume accounts. Participated in Association Management Company Institute's (AMCI's) annual meeting and tradeshow (AMCI is a trade association that focuses on the unique needs of association management companies) and the HelmsBricoe Annual Business Conference. In partnership with the CVB's Marketing and Communications Department, presented at the revamped Tourism Talk Live event (formerly named the Quarterly Marketing Update Meeting) with round-table discussions where partners were updated on the Raleigh, N.C., destination brand strategy and PIXL (Partner Information eXchange Login) and received an in-depth look into partnering with the CVB's Sales and Convention Services Departments. Served on boards and committees in many key industry associations to position Greater Raleigh CVB and its sales team as leaders with influence. Organizations include eight Meeting Professionals International chapters, American Society of Association Executives, Association Executives of N.C., seven chapters of Professional Convention Management Association, N.C. Technology Association, International Association of Exhibitions and Events, Religious Conference Management Association, National Coalition of Black Meeting Planners, Society of Government Meeting Professionals (SGMP), N.C. SGMP and Convention Sales Professional International.